The tax code may be bloated, but that doesn't mean your check to the IRS has to be. 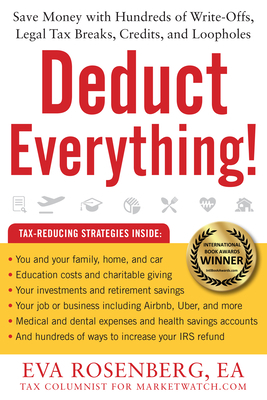 Let Deduct Everything be your ultimate guide to lowering your annual tax bill. Eva Rosenberg, BA, EA, (Northridge, CA) known as the Internet's TaxMama(R), publishes the popular TaxMama(R).com website, cited by Consumer Reports magazine as a top tax advice site, and a LIFE Magazine Editors Pick. Dean of TaxMama(R)'s Online Enrolled Agent Review Course, Eva is training a new breed of tax professionals to pass the annual Internal Revenue Service license examinations. TaxMama(R)'s tax professionals learn to understand and serve small businesses and accounting firms. Find TaxMama's(R) columns at MarketWatch.com and Equifax.com. Eva Rosenberg is regularly featured in publications as diverse as The Wall Street Journal and U.S. News & World Report to Rolling Stone and Women's Day. TaxMama(R) is the author of Small Business Taxes Made Easy, named one of the best tax books of 2005 by Entrepreneur Magazine and silver medal winner of the 2011 Axiom Business Awards.